I keep finding myself looking back through my past outfits on the blog. I keep catching myself spending way too much time doing it. I kind of feel like I am stalking myself, actually. I miss my clothes. It's such a superficial feeling, but it's legitimately happening. Dear regular-size-clothes (and shoes! I have some serious cankles), I will see you soon. This outfit marks the first time I have worn tights this year. It's a milestone, you guys. Winter is here. Today the high is 36, which is cold in Oklahoma. Apparently people in other parts of the country are getting snow. Sorry, guys. I'm convinced it's still fall. Our seasons are so strange - we still have green leaves on a lot of the trees. It's all very confusing and messes with you, emotionally, you know? Oh, maybe that's just me. 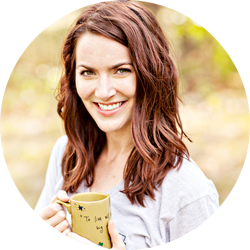 I remember longing so much for non-maternity pants toward the end of both pregnancies, and I'm sure I will again with this one. You're still looking great!! I stalk my own pictures as well...totally normal! (right??!) :) You look so great...you're SO close!! haha yes, you will see those clothes again very soon!! :) looking good! Very pretty outfit! I love the all black, such cute booties and the striped blazer looks woderful with it, giving it more structure. Pretty!! Seasons are so weird! I had to wear tights for the first time yesterday and then again today. And yeah, we got some snow, but thankfully not very much. Anyway, you look super awesome and I love this blazer! 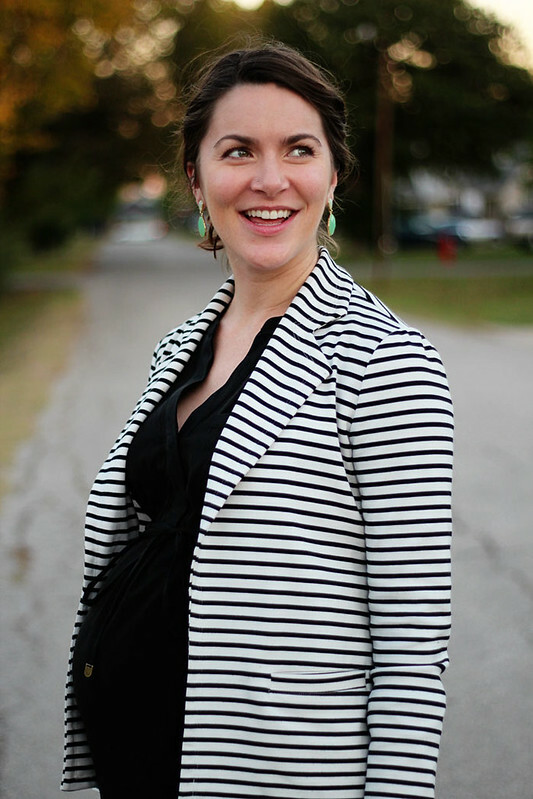 love your striped blazer! looking super chic and cute! I'm impressed you are in tights! When I was that far along there was no way I could physically put tights on. I could barely put on socks! I always check in your posts first in my feed to check for baby news now :) So close! This outfit is perfect - I love how you stuck with black and white. That blazer is lovely, and I love the black boots with tights. You are such a classy pregnant lady. I feel like I'd want to wear only sweats. And, even if I wore normal clothes, I'd look a hot mess. Aaaaand I want to steal your blazer. Can I be honest? When I think about pregnancy, I think about how much of a struggles clothes and weight gain will be for me. I know there are soooo many good parts like actually having a child, but the other stuff is hard too! You look amazing. I love the stripes. You will be reunited with your non-maternity clothes soon! You look amazing! 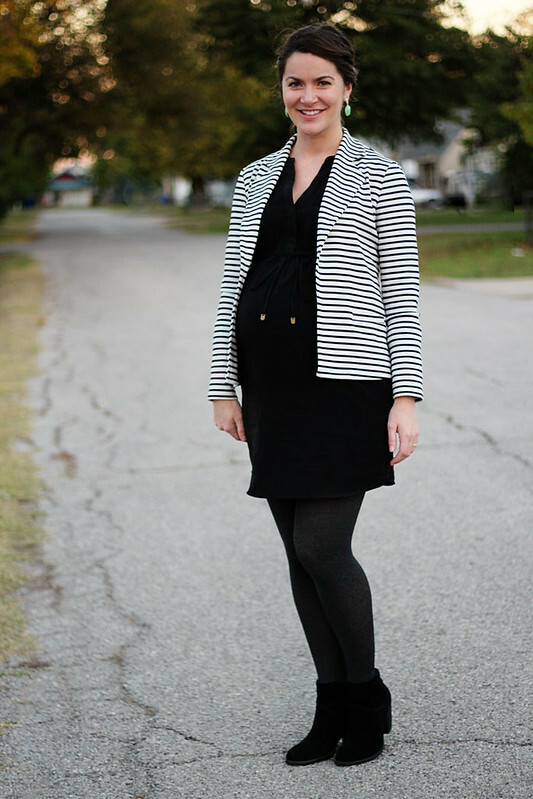 Love your striped blazer! It is like you forget what it is like to be normal sized. You will be back there before you know it though! Haha. I totally miss my non-maternity clothes too!!!! :) you are too cute. I stock my looks too and constantly change up my outfits, I rarely wear the same outfit the same way anymore, which helps with using what I have in my closet. I love the stripes and earrings. Weather is totally nuts. The temps here would classify it as winter, but it looks like fall for real outside. You are just glowing! We're getting so close to baby time. I'm so excited to meet your wee one. 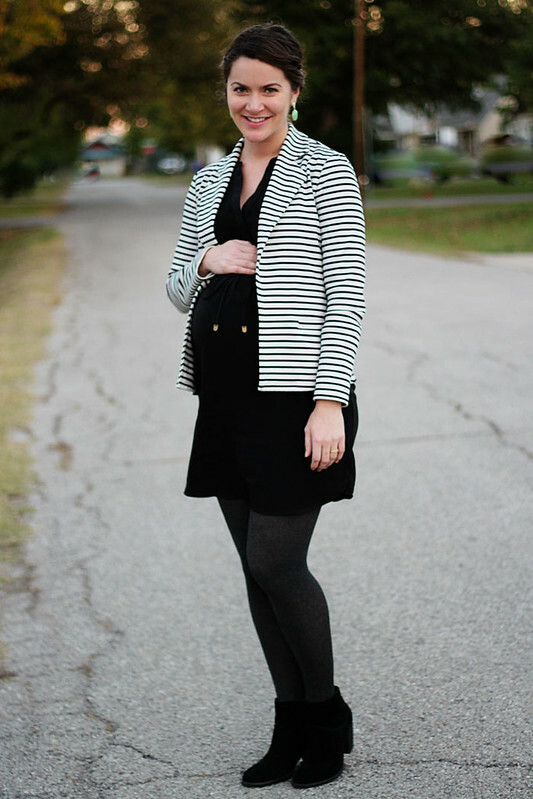 This striped blazer is lovely!